For my students writing their own phenomenologies of technology this week, Heidegger offers one way to proceed from a question, through a description, to a concept. In later posts we will show how Borgmann and Ihde proceed differently, though still broadly with the school of phenomenology. And so, below is a classic example of how the later Heidegger uses a phenomenological description to arrive at a concept that names the essential character of modern technology. His hope is that if we see our own participation in the meaning of technology, we will be able to have a free relationship to it. The section below is from the middle of his classic essay The Question Concerning Technology. The selection begins with a question, sets out the task of how to think phenomenologically, describes the technological character of a hydro-electric dam, and then uses this example as a paradigm for conceptualizing modern technology as such. “What is modern technology? It too is a revealing. Only when we allow our attention to rest on this fundamental characteristic does that which is new in modern technology show itself to us. And yet the revealing that holds sway throughout modern technology does not unfold into a bringing-forth in the sense of poiesis. The revealing that rules in modern technology is a challenging [Herausfordern], which puts to nature the unreasonable demand that it supply energy that can be extracted and stored as such. But does this not hold true for the old windmill as well? No. Its sails do indeed turn in the wind; they are left entirely to the wind’s blowing. But the windmill does not unlock energy from the air currents in order to store it. In contrast, a tract of land is challenged into the putting out of coal and ore. The earth now reveals itself as a coal mining district, the soil as a mineral deposit. The field that the peasant formerly cultivated and set in order [bestellte] appears differently than it did when to set in order still meant to take care of and to maintain. The work of the peasant does not challenge the soil of the field. In the sowing of the grain it places the seed in the keeping of the forces of growth and watches over its increase. But meanwhile even the cultivation of the field has come under the grip of another kind of setting-in-order, which sets upon [stellt] nature. It sets upon it in the sense of challenging it. Agriculture is now the mechanized food industry. Air is now set upon to yield nitrogen, the earth to yield ore, ore to yield uranium, for example; uranium is set upon to yield atomic energy, which can be released either for destruction or for peaceful use. This setting-upon that challenges forth the energies of nature is an expediting [Fordern], and in two ways. It expedites in that it unlocks and exposes. Yet that expediting is always itself directed from the beginning toward furthering something else, i.e., toward driving on to the maximum yield at the minimum expense. The coal that has been hauled out in some mining district has not been supplied in order that it may simply be present somewhere or other. It is stockpiled; that is, it is on call, ready to deliver the sun’s warmth that is stored in it. The sun’s warmth is challenged forth for heat, which in turn is ordered to deliver steam whose pressure turns the wheels that keep a factory running. The hydroelectric plant is set into the current of the Rhine. It sets the Rhine to supplying its hydraulic pressure, which then sets the turbines turning. This turning sets those machines in motion whose thrust sets going the electric current for which the long-distance power station and its network of cables are set up to dispatch electricity.15 In the context of the interlocking processes pertaining to the orderly disposition of electrical energy, even the Rhine itself appears as something at our command. The hydroelectric plant is not built into the Rhine River as was the old wooden bridge that joined bank with bank for hundreds of years. Rather the river is dammed up into the power plant. What the river is now, namely, a waterpower supplier, derives from out of the essence of the power station. In order that we may even remotely consider the monstrousness that reigns here, let us ponder for a moment the contrast that speaks out of the two titles, “The Rhine” as dammed up into the power works, and “The Rhine” as uttered out of the art work, in Holderlin’s hymn by that name. But, it will be replied, the Rhine is still a river in the landscape, is it not? Perhaps. But how? In no other way than as an object on call for inspection by a tour group ordered there by the vacation industry. The revealing that rules throughout modern technology has the character of a setting-upon, in the sense of a challenging­ forth. That challenging happens in that the energy concealed in nature is unlocked, what is unlocked is transformed, what is transformed is stored up, what is stored up is, in turn, distributed, and what is distributed is switched about ever anew. Unlocking, transforming, storing, distributing, and switching about are ways of revealing. But the revealing never simply comes to an end. Neither does it run off into the indeterminate. The revealing reveals to itself its own manifoldly interlocking paths, through regulating their course. This regulating itself is, for its part, everywhere secured. Regulating and securing even become the chief characteristics of the challenging revealing. What kind o f unconcealment i s it, then, that is peculiar to that which comes to stand forth through this setting-upon that challenges? Everywhere everything is ordered to stand by, to be immediately at hand, indeed to stand there just so that it may be on call for a further ordering. Whatever is ordered about in this way has its own standing. We call it the standing-reserve [Bestand]. The word expresses here something more, and some­ thing more essential, than mere “stock.” The name “standing­ reserve” assumes the rank of an inclusive rubric. It designates nothing less than the way in which everything presences that is wrought upon by the challenging revealing. Whatever stands by in the sense of standing-reserve no longer stands over against us as object. 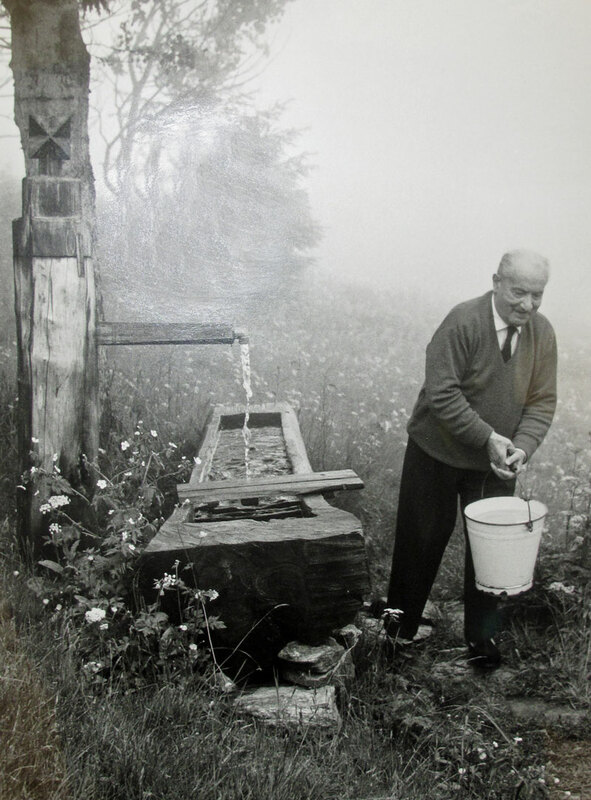 Click here for a great and creative website devoted to Heidegger’s essay. Great post. Your outline of the essay provides a clear set up for what you want the students to notice.